The sun sets on another workday for these shrimp trawlers docked at Crosby’s Fish and Shrimp, located in Charleston County. Locally owned and operated, Crosby’s has been serving Folly Beach and James Island for over 30 years. Crosby’s Fish and Shrimp is a different company than Crosby’s Seafood at the base of the old Ashley River Bridge in downtown Charleston, though the two families are related. The former has its own boats and sells whatever it’s catching – along with bait, fishing tackle, beer, and ice. When the weather is good, it often hosts Friday-night dock parties. 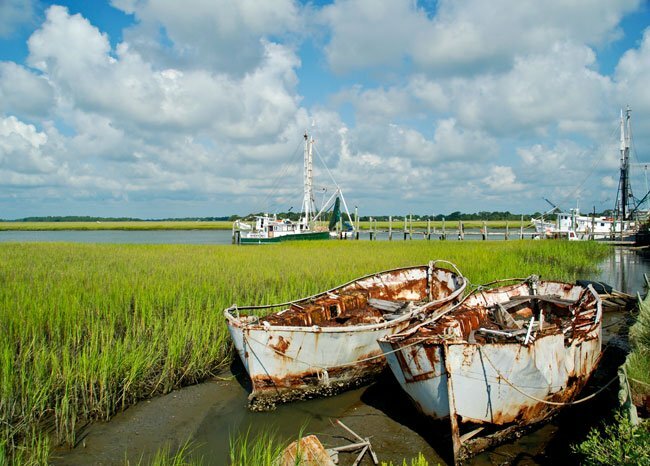 Folly Beach calls itself the “Edge of America” and has a friendly and relaxed vibe. It has a lively downtown area and is a favorite among locals and visitors alike. 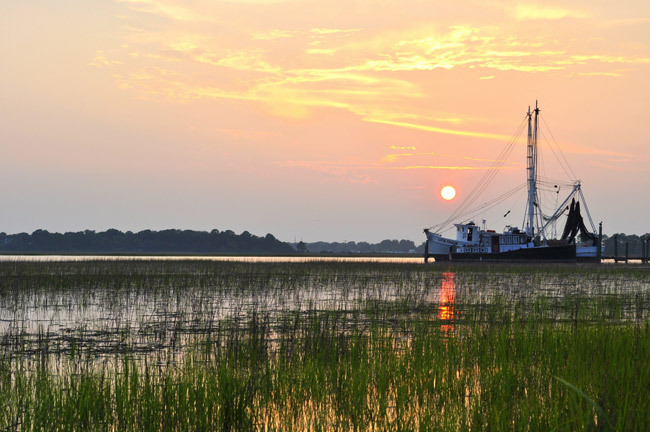 Learn more about South Carolina shrimp, South Carolina oysters, and Crosby’s Fish and Shrimp. Looking for 500 pounds of fresh shrimp. Could turn into an ongoing business relationship. Hi there, My name is Michael C. Crosby of New York.My teenage daughter looked up my family tree. I have relatives by the name of Crosby that lived in South Carolina “New Burry” John Elias Crosby 1855-1953. His father John Malachi Crosby. 1808-1855. My daughter is against sending out an email but what the hell you never know. I would like to know if these names sound familiar and could be long lost cousins??? Hi, David. While we are not connected to the business, I am happy to share their phone number with you: (843) 795-4049. Best of luck! I am looking to relocate I have over 30 years in seafood sales, etc. Are you looking for any help increasing your business? If so, let me know. Dave Cooper.